The best adventures are your own. But from time to time, either by luck or design, your adventures are epic enough to capture the imaginations of the rest of us. Such is the case with nine South Sound residents. Four made history. Two took an extended vacation. One stayed home. One forsook his goals to save a life. And another just went fishing with his dad. They all ended up with stories they'll tell forever. And they've all been selected The News Tribune's 2006 Adventurers of the Year. Jason Edwards has been to the top of the highest peak on all seven continents, including Mount Everest. But, as far as the 47-year-old Tacoma climbing guide is concerned, the mountain in his backyard is just as special. "Mount Rainier really feels like my home," Edwards said. On July 12, Edwards reached a landmark on Rainier that only five other men have accomplished. He reached the summit for the 300th time. Edwards has spent thousands of nights on the slopes of Rainier leading expeditions for Rainier Mountaineering and, now, International Mountain Guides. Few know the mountain better. 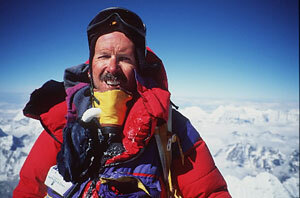 "I still approach the mountain like it is lethal," said Edwards, who first climbed Rainier in 1976. "I'm more cautious than the average Joe." Edwards will be spending plenty more time on Rainier in the coming years. IMG starts guiding summit climbs in 2007. Summiting Rainier 10 times per year for the next decade isn't unrealistic. "The nature of my goals are opportunistic," Edwards said. "...400 has entered my mind."